The Atomic Starburst Quilt was originally designed with everything mid century, Palm Springs, and summer vibes in mind. The mid century modern movement produced so many amazing pieces of art, furniture, and even houses. You know what else they did well? Christmas, they did Christmas right. Tinsel, aluminum trees, golden baubles, silver sparkles, and pointy decor. In an homage to a bygone era, I've adapted my Atomic Starburst Quilt pattern into a Atomic Starburst Tree Skirt available in two sizes and shapes! The real prize is finishing this project, am I right?! Look below for the instructions on how to make your new tree skirt! 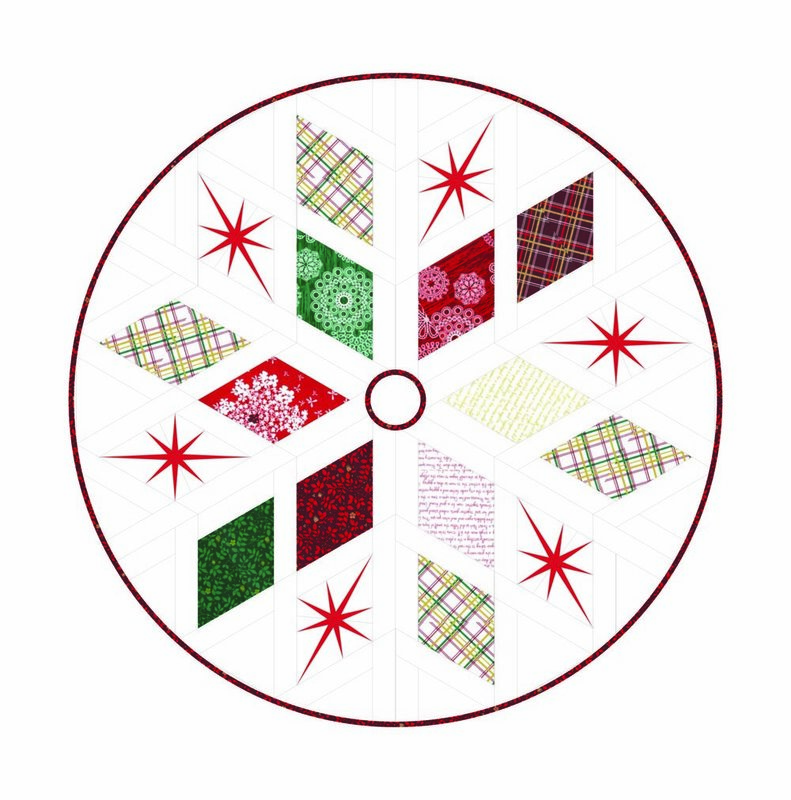 The Atomic Starburst Tree Skirt is made by combining foundation paper pieced Starburst blocks with traditional piecing for a vibrant, mid-century modern tree skirt. The Atomic Starburst Quilt pattern is required. There are two sizes to choose from that can easily be cut in two different shapes! General piecing instructions are found in the Atomic Starburst Quilt pattern. Foundation paper piece the Starburst Blocks using the instructions from the Atomic Starburst Quilt pattern. Sew one of the SMALL SASHING strips to the top left side of all Starburst Blocks and Full Diamonds. Sew one of the LARGE SASHING strips to the top left side of all Half Diamonds. Sew one of the LARGE SASHING strips to the top right side of all Starburst Blocks, Full Diamonds and Half Diamonds. Build 6 pyramids as shown below. Sew together the pyramids in groups of three. Sew together the two halves. Cut the tree opening and cut into a circle or hexagon. Bias-cut binding is highly recommended. See my video tutorials on YouTube: How to make bias binding and how to cut a quilt into a tree skirt!